In order to make your home or business really look its best you owe it to yourself to take care of finding the finest Charleston power washing company. At Lowcountry Powerwashing this just happens to be the feedback we get from our satisfied, local customers. Just as cleaning the inside of your residential or commercial space is important for creating a harmonious atmosphere, it is time to also think about the importance of the outside. The exterior of your home or business is what makes a good first impression and adds curb appeal. So what does the outside of your structure say about you, your family or your business right now? 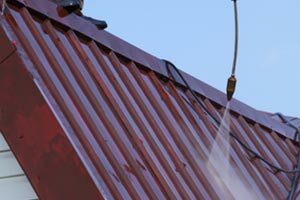 Our Charleston Powerwashing experts can help restore, renew and revitalize the outside of your building and help make it look as good as new. There is no reason to let the outside of your business or house look less than immaculate when we can take care of that for you. Not only does the dirt, grime, mildew, mold and other debris that builds up cause your building to look unappealing, it can actually lead to complications. Substances make walkways slick and dangerous, get under siding and begin to cause rot or collect on roofing and start to create sagging. By letting us take care of this important cleaning and exterior property restoration service, you can help prevent all of this from happening. Take care of your home or business, both cosmetically and structurally, by letting the Lowcountry Powerwashing team take care of your power washing and soft washing services. We use only the most innovative equipment and highest quality products to get the job done. This is part of how we ensure that you get the best in efficient cleaning with long lasting results. 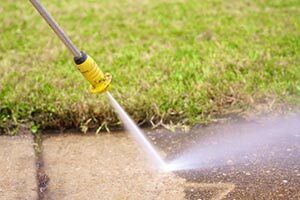 Our team of highly trained professionals is able to provide for you a wide range of power washing and pressure cleaning services. So you can rest assured that you are going to love the final results of the work we complete for you. Our cleaning system is designed to help rid the exterior of your home from unsightly and harmful substances that collect on your siding, roof, gutters, deck and other surfaces. Your roofing alone is basically the most important part of your home yet it requires care, like professional cleaning, to help make sure it holds up well. Without cleaning matter like algae and mold gather and can cause problems like rot. Let us help take care of and ensure longevity through professional cleaning. The exterior of your business is just as important but for slightly different reasons. In many cases, the outside of your commercial space is what your potential clients see first. So it is, literally, what makes the first impression. It says a great deal about how you handle your affairs or how seriously you take your business. So it only makes sense to want to keep it looking its best. Time, weather and other factors beyond your control can all wreak havoc on the exterior of your business. Our job is to reverse these effects and make your building look brand new again. Contact us today so we can get started. We look forward to showing you in person how our work earned us the impeccable reputation we have. The Lowcountry Powerwashing team takes great pride in the work we provide for the local residents and business owners of Lowcountry Powerwashing. Our main goal is to offer to you the highest standards of workmanship and customer care. We are not satisfied with the job until you are. Let our Charleston Powerwashing Contractor start with giving you your free quote. From there we can demonstrate to you firsthand how our strong work ethic, dedication to quality work and commitment to customer satisfaction made us the local favorite. We can work with a variety of materials to help beautify the exterior of your home or business to its fullest potential. Contact us today so we can get started. If you are looking for a Charleston Power Washing expert then please call 843-729-8079 or complete our online request form.